I Want to Work in an Association – Now What??? Published! | Find meaning at work and advance in your career. I’m happy to announce that my book I Want to Work in an Association – Now What??? 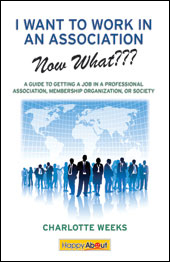 A Guide to Getting a Job in a Professional Association, Membership Organization, or Society is available! In the works for nearly a year, this endeavor would not have been possible without the more than 50 association professionals who contributed their knowledge and experiences – THANK YOU. Why did I decide to write this book? Simple – to let people know that this industry exists, and to provide them with the resources they need to be hired in the field. Nearly everyone who contributed to this book “fell into” the profession because it still flies under the radar. Career changers and recent college grads don’t realize this great opportunity is out there. Even many of the job hunters who are aware of associations don’t realize that it’s different from other organizations. While the association industry is subject to many of the same problems as others (i.e. layoffs, financial concerns, etc. ), there are some key attractions, like the belief that you’re getting the “best of both worlds” – pay is often competitive with for-profits, yet associations are more mission-driven rather than bottom-line driven. Several of the people interviewed for this book expressed the sentiment that they liked that they are able to contribute to missions important to them, while still making a good living. Regardless of what role you are hired into, chances are you’ll have to wear multiple hats – even more likely at smaller organizations. With members being the highest priority in an association, a customer service mentality is at the core of the whole operation. Several hiring managers told me this is one of the most important attributes an employee can possess. Though many of the same career management principles still apply, it helps to know about some of the unique facets of the industry, not to mention association-specific resources such as niche job boards. So, if you’re thinking about making a career change or want to learn how to advance in your association career, this book is for you! This entry was posted in Association Career, Book and tagged association industry, Associations, Career, Career Change, job hunt, job search, Professional association. Bookmark the permalink.